What’s stopping you buying an electric car? 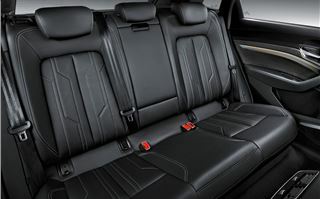 You need space to carry a family, perhaps, or the range offered by an EV isn’t quite long enough for your requirements? Fortunately, that’s all changing as premium manufacturers are competing to bring their long-range, upmarket electric SUVs to the market. Jaguar was first with its impressive I-Pace. Mercedes-Benz is set to bring out the ECQ next year. But now it’s Audi’s turn with the e-tron. 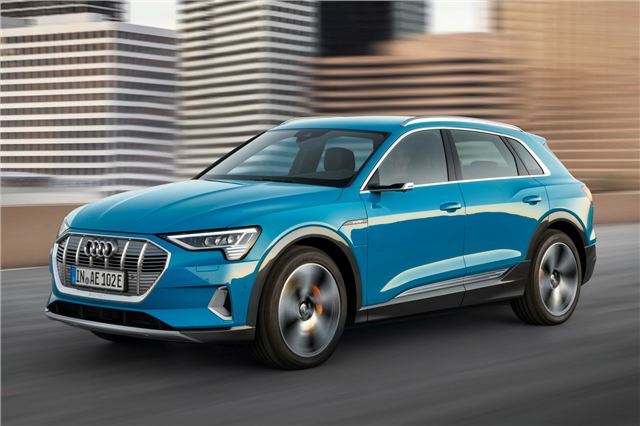 The firm’s first fully-electric vehicle (a four-door coupe badged the e-tron GT will follow in 2020), the e-tron is close to the Q8 in size and has a claimed range of around 250 miles under new fuel economy tests. That all sounds very promising. And first impressions are good. It’s not as quirky to look at as the Jaguar I-Pace, but to many people that may be a plus. It looks like a premium Audi SUV and premium Audi SUVs sell well. You don’t need to be an early adopter just to be interested in the e-tron. Inside it feels very similar to the recent Q8, which is a very good thing indeed. You won’t find any cheap looking materials anywhere. It’s all very comfortable and high tech, with two touchscreen displays in the centre of the dash practically replacing all buttons in the cabin. 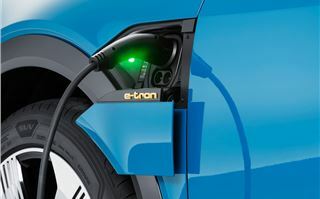 These are standard on all e-tron models, as is Audi’s latest Virtual Cockpit replacing the dials behind the steering wheel. All these systems are the same as the Q8 (as well as the latest A6 and A7) and are simple and slick to operate. It’s good news from a practicality point of view, too. 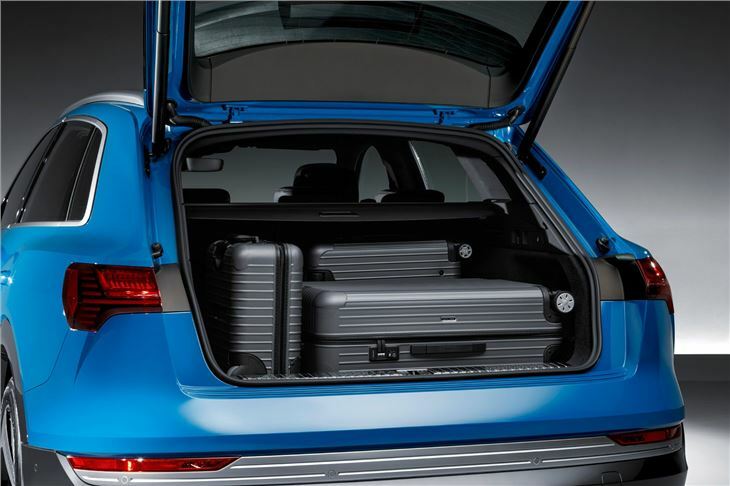 At 605 litres the boot matches the Q8, although isn’t as big as the Q7 (and there’s no seven seat option). 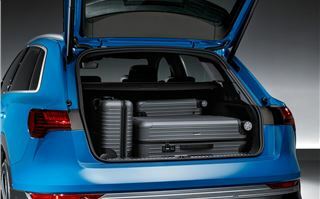 The batteries eat into boot space slightly - the boot is shallow, but dropping the rear seats is easy enough if required. 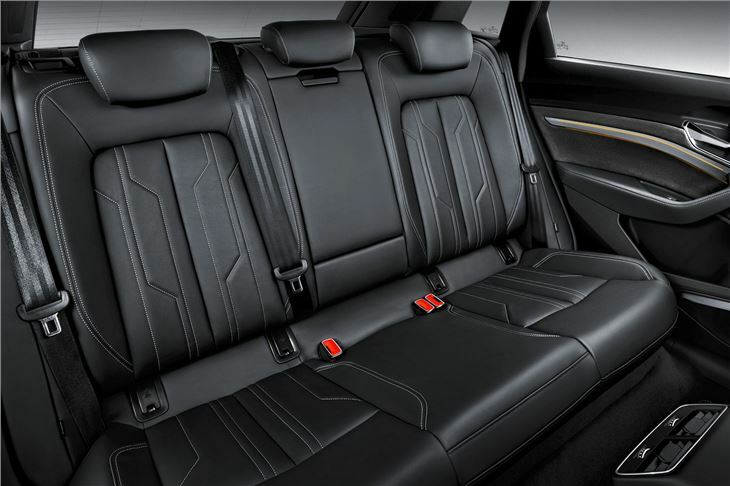 There’s also a pleasing amount of space in the rear - there simply isn’t an issue with head or legroom for even the tallest of passengers. One gadget Audi’s launching with its e-tron is virtual door mirrors. Two high-definition cameras replace conventional glass mirrors, displaying an image through a screen on the inside of each door. The idea is that it's easier to adjust the brightness, providing better visibility in the dark or in poor weather. They also provide a wider view when reversing compared to conventional mirrors. They work well to a point, but it will take a while before glancing down to the screens (which are lower than normal door mirrors) starts to feel natural. They look a bit odd, too - to give a good view, Audi’s had to position the cameras on the end of stalks. 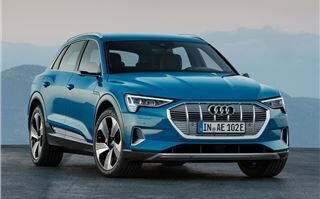 Fortunately the standard e-tron comes with normal mirrors and, based on the mirrors alone, we wouldn't be too fussed about spending the extra cash for one of the launch edition models. We’ve established that the e-tron is a very good Audi SUV - but so are most of the Q-badged models in the range. 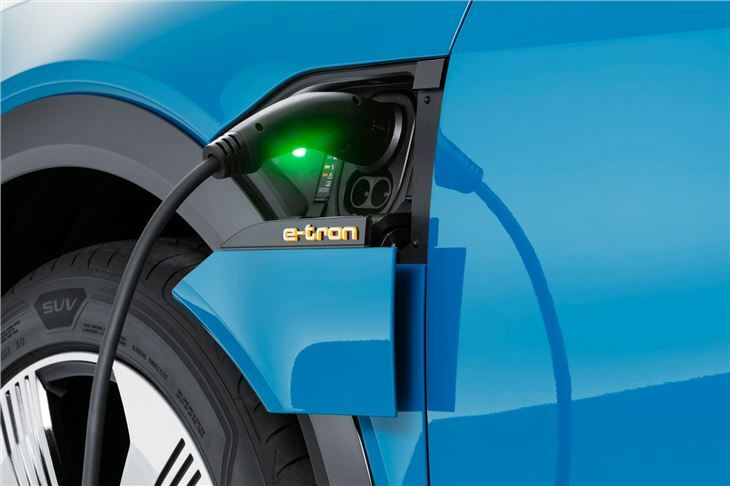 What makes the e-tron different is its 95kWh battery pack situated under the floor and powering two electric motors (one on each axle). If you’ve not driven an electric car, you’re in for a surprise. In a good way. It makes for an extremely refined drive - and it’s all very easy. No waiting for the automatic gearbox to find an appropriate gear, just hit the accelerator and it pulls. It’s not quite as fast the Jaguar I-Pace or Tesla Model X. It’s quick enough - hitting 62mph in 5.7 seconds - but it doesn’t shove you back in your seat, a happy byproduct of many electric vehicles. A faster version is likely to follow, but most buyers won't be too concerned about the standard's car acceleration. One thing they will be concerned about is the range. Yes, that thing that everyone talks about when it comes to electric cars. Officially it will return ‘more than’ 248 miles between charges. It’s a bit early to say how accurate that is - we’ll have to wait until we’ve spent some time with the e-tron in the UK - but our early drive suggests that you might struggle to see 200 miles. And that could be an issue. Then there’s the purchase cost. 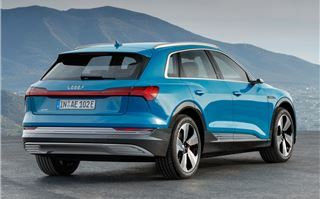 At launch, the Audi e-tron starts at £71,490, rising to £82,240 for the Launch Edition and £89,490 for the ultra-exclusive Edition 1. That’s a lot of money for dabbling your toe into the world of electric vehicles. 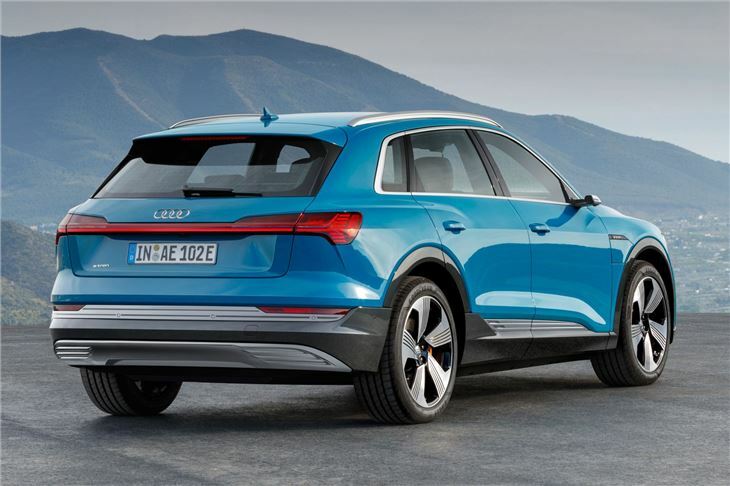 It will also buy you a high-spec Audi Q8 with a diesel engine, and we suspect the temptation of hassle-free running might be too much for many Audi SUV buyers. 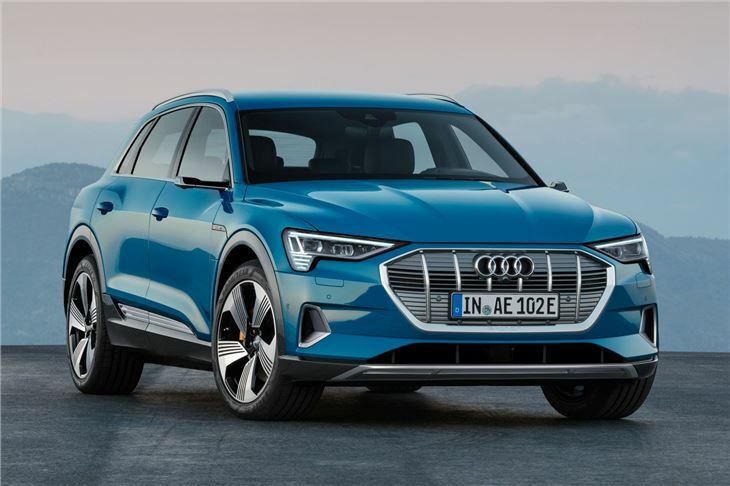 Putting concerns about cost and range aside, the e-tron is a no-less-than-brilliant entry into the electric vehicle market for Audi. It’s great to drive, if not quite as impressive as the Jaguar I-Pace, and it’s up to the firm’s usual high standards in every way. As a car to live with every day, there probably isn’t a better electric car on the market. 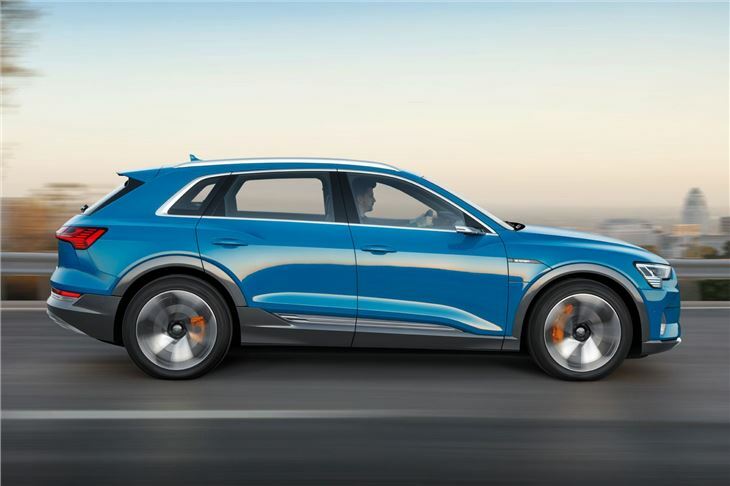 The Audi e-tron will go on sale early in 2019.